Increase Economic Competitiveness and Job Growth - US manufacturers are the cornerstone of our nation’s industrial sector and a vital source of good-paying jobs. By improving energy performance, we can help businesses reduce waste, create and sustain jobs, save money, and invest in long-term growth. Achieve Climate Goals - The industrial sector is America’s biggest end-use emitter of greenhouse gases (GHGs). Unless we have a strategy to reduce these emissions, we have little chance of hitting our climate targets. Keep Up with Market Trends – Businesses, cities, states, and entire countries are enacting policies to promote cleaner and more efficient energy use, including standards and incentives that will impact major industries. By helping our manufacturers stay on the forefront of changing energy demand, the US can ensure their ongoing access and competitiveness in evolving global markets. This report examines each of these reasons for making industrial efficiency and emissions reduction a national priority. It also lays out a number of clear, achievable pathways to saving energy, increasing competitiveness and cutting carbon in US industry, including wider use of industry best practices, increased deployment of existing technologies, and accelerated innovation of new technology solutions. These pathways offer a useful guide for future policy discussions between government, industry, labor, and other stakeholder groups. If the top five energy consuming manufacturing sectors in the US were their own country, they would rank 9th in the world in terms of total energy used. We can do better. A significant percentage of manufacturing energy that’s wasted can be saved, which in turn saves money that manufacturers can otherwise use for capital and workforce investments that make them more productive and competitive. The studies analyzed two energy savings opportunity ‘bandwidths’: (1) the “current opportunity” bandwidth represents energy savings, compared to current typical energy consumption, if the best technologies and practices available are used to upgrade production; and (2) the “R&D opportunity” bandwidth represents additional energy savings available, after realizing the current opportunity, if applied R&D technologies under development are deployed.10 As the table below makes abundantly clear, the opportunity to save energy and reduce emissions among EIMs is enormous. If industries in just these six states were to meet DOE’s projections, the energy they saved would be equal to 4% of all primary energy used by the entire country. It’s clear that energy savings opportunities are abundant. 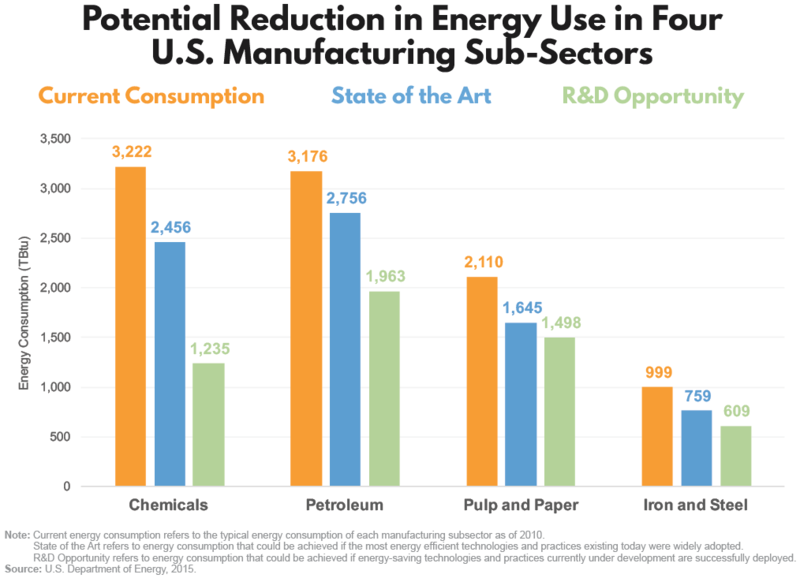 If US manufacturers can cost-effectively realize these savings by making capital investments in more energy efficient technologies and practices they will increase their profits, their ability to reinvest, and their economic viability. And because U.S manufacturing is such a critical supplier and catalyst for the overall economy, these benefits will also accrue to workers and businesses across all economic sectors. It will also position US manufacturers, and the nation as a whole, to be winners in perhaps the most important global economic race of the 21st century. substantial numbers of American manufacturing workers are employed in the production of energy efficiency, clean energy, and low carbon emission technologies. For example, the USEER found that 315,578 workers were employed in manufacturing ENERGY STAR-rated appliances and other energy efficiency-certified building and lighting products. Another 476,338 workers were employed in automotive manufacturing subsectors for component parts that increase vehicle fuel economy. The USEER also found that almost one of every five US construction workers (1.27 million out of 7.1 million) support the construction or installation of energy efficient technologies.14 This is a strikingly large proportion of the construction workforce, particularly given the uneven mix of state and federal policies that incentivize energy efficiency. Indeed, one analysis found that if all states adopted a few proven energy efficiency policies, they could create over 600,000 new jobs.15 These figures illustrate the job-creating potency of a business model in which the savings from reducing energy waste can be reinvested to undertake even more ambitious energy efficiency efforts—a virtuous cycle that also supports steady employment for boilermakers, pipefitters, glaziers, insulators, and other skilled craftsmen and women. It’s worth emphasizing that the men and women employed in the manufacturing and construction sectors are disproportionately workers without a four-year college degree, often considered a proxy measure for membership in America’s working class. This group has been on the losing end of structural trends in the overall labor market over the past few decades, but manufacturing and construction jobs provide a chance for working class Americans to climb the economic ladder. A proven means to climb that ladder are joint labor-management apprenticeship programs prevalent in both manufacturing and construction fields. This “earn while you learn” system provides high-quality skills training, well-defined points of job access, and long-term career pathways. Apprenticeship programs are also central to Project Labor Agreements, or Community Workforce Agreements, that are often used for publicly funded infrastructure projects, and which enable the training and hiring of workers from local and underserved communities. The bottom line: policies and investments that help create and sustain good-paying manufacturing and construction jobs in turn enable greater equity and mobility in a US economy that badly needs more of both. To minimize the risk of severe damages from a changing climate, the US and other nations need to drastically reduce the amount of carbon dioxide and other GHGs they release into the atmosphere.16 This will require significant emission cuts in all major segments of the economy. The US has been fairly successful in cutting carbon from the power sector in recent years, thanks to strong consumer demand for renewable energy and the switch from coal to natural gas. National standards for vehicles have had a significant impact on fuel efficiency and emissions in the transportation sector.17 Unfortunately, the US has not taken such substantive steps to help its industries move in the same direction—a shortcoming that could put even long-term climate goals out of reach. The electric power sector has historically been the largest source of greenhouse emissions in the US, though the transportation sector now surpasses it by a narrow margin. According to the Environmental Protection Agency’s “U.S. 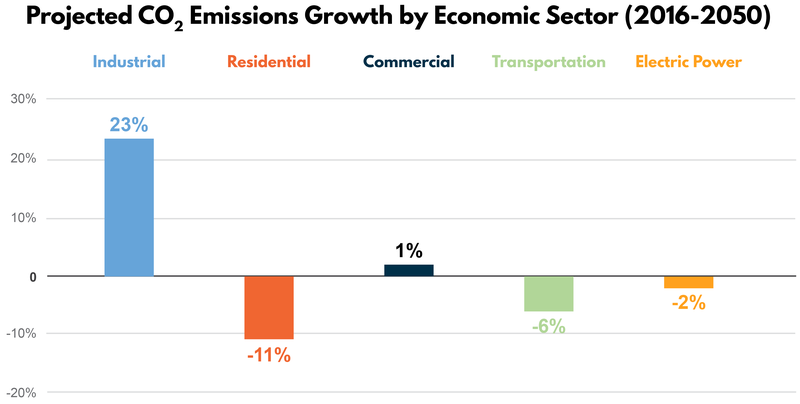 Greenhouse Gas Inventory,” transportation and power each accounted for 29% of emissions in 2016, with the industrial sector assuming its usual position as distant third, with 22%.18 Its smaller share of emissions could help explain why there’s been somewhat less focus and urgency around cutting carbon in industry, compared to power and transportation. The industrial sector is actually the nation’s largest source of greenhouse gas emissions. In 2016 industry was responsible for 1,894.8 million metric tons (MMT) of carbon dioxide equivalent (CO2e), or 29% of the U.S total. This methodology clearly suggests a need for increased attention and urgency around industrial emissions. Emissions from a range of economic activities like construction and mining are included in the “Industry” designation. But similar to industry’s energy consumption, GHG emissions from industry are also concentrated within manufacturing. One analysis of the most energy intensive manufacturing plants in the US, representing less than 0.5% of all US manufacturing facilities, estimated that they were responsible for roughly 25% of US industrial sector emissions, the equivalent of 5% of all U.S GHG emissions.20 This provides yet another reason to make manufacturers a priority focus of any effort to promote smarter energy use and emissions reduction in American industry. The lesson here is that transitioning the grid to renewables and other low-carbon power sources is helpful in addressing industrial emissions, but it can only do so much. Successfully cutting carbon in this sector will require significant onsite action at these facilities. Though the industrial sector has not been a primary focus of energy and climate policy, industrial GHG emissions have decreased in the US since 1990, with some sub-sectors dropping dramatically over that period of time. For example, emissions from iron and steel production dropped by almost 60% between 1990 and 2016 (from 99.1 MMT CO2e to 41.0 MMT).25 This was the result of improvements in energy efficiency, but even more importantly a shift from ore-based production to increased recycling of scrap steel. Regardless of what has been driving it, the decades-long trend of decreasing industrial emissions in the US may be reaching its end. The US Energy Information Administration’s (EIA) reference case projects that energy-related CO2 emissions from industry will rise 23% between 2017 and 2050, while other economic sectors see flat or declining emissions.27 Much of this growth is attributed to expanded output driven by sustained low prices for natural gas, especially among manufacturers like chemicals producers that use gas as a fuel and feedstock. As the impacts of energy consumption and climate change become harder to ignore, public policy and consumer demand worldwide are curving inexorably toward efficient, low-emissions processes and products. Washington should acknowledge this trend in global markets and pursue policies and investments that will help US manufacturers stay ahead of it. If we fail to heed the international and domestic warning signs discussed below, American industry could find itself racing to catch up to the world economy instead of leading it. When it comes to catalyzing innovation, the US fell behind eleven countries in Europe and Asia in terms of government investment in energy RD&D (as a percentage of GDP) in 2015. Regardless of current inaction at the national level, American states, cities, and businesses are adopting explicit emission reduction targets, clean energy goals, and other policies that will shape their investment and procurement decisions. Many of these activities could create opportunities for some domestic manufacturers, as well as challenges for those who fail to keep up. Numerous US manufacturers have made commitments to purchase clean energy and reduce GHG emissions, which will have significant impacts on their operations and domestic supply chains. International and domestic actions to reduce emissions and energy consumption show a clear and escalating pattern, and one that will certainly have an impact on markets for manufactured goods. By taking steps now to maximize efficiency and clean energy use, US manufacturers can increase their ability to remain competitive as global business priorities evolve. With a clear and focused national strategy, the federal government could support this shift among American manufacturers and the workers they employ. The diversity and complexity of the US industrial sector is staggering. It consists of hundreds of sub-sectors, many of which rely on processes and technologies that are unique to that particular sub-sector. As such, reducing energy waste and emissions in the industrial sector will require a wider array of solutions than any other economic sector. As the data from the Inventory reveal, nearly three times as much industrial emissions result from off-grid processes as from grid-sourced electricity. This explains why the transformation of the power sector to lower carbon sources to date has had a limited impact on industrial emissions, and why it’s so important to look for on-site solutions. There are limits to what portion of industrial GHGs can be avoided, based on the laws of thermodynamics and chemical reactions for which there simply are no emissions-free alternatives.40 For the foreseeable future, the only way to deal with a significant portion of industrial emissions will be to capture, potentially utilize, and permanently sequester them. With its extensive supply chains, the manufacturing sector is uniquely positioned to enable more efficient energy use and lower GHG emissions in other end-use economic sectors, such as transportation and buildings. What follows is a summary of what we view as the most important pathways to do so, which are grounded in a recognition of the unique industrial sectoral factors delineated above. DOE estimates that there is another 154 GW of technical potential for CHP at industrial facilities for on-site use and the export of excess electricity back to the grid, which would nearly triple our current capacity. Despite their sizeable economic and environmental benefits, a number of barriers keep CHP and other industrial efficiency measures from reaching their deployment potential. Common challenges include: the dominant utility business model, which often positions CHP and end-use efficiency as a source of revenue erosion; internal competition for capital investment within companies, where the scale and payback of investment in CHP and end-use efficiency often competes unfavorably with investments that are smaller and yield payback more quickly; and a lack of awareness and knowledge about the technical and economic potential of CHP and end-use efficiency. If these and other barriers can be overcome, the energy savings, GHG emission, and economic impacts of deploying these technologies are demonstrable. As noted above there exists a multiplicity of sub-sectors within U.S manufacturing. This fact, in turn, requires innovation in a diverse range of advanced manufacturing technologies that can be applied across the entire sector to achieve emission reductions. Importantly, advanced manufacturing innovation must also encompass material as well as energy efficiency in product design and production, which includes the light-weighting of materials, the reduction of material waste, and re-use of materials, all of which can achieve substantial reductions in energy use and GHG emissions. Key RDD&D opportunities and challenges for this technology include high efficiency “super-boilers”; waste heat recovery systems; advanced non-thermal water removal technologies; and low-energy, high-temperature materials processing using selective heating techniques, such as microwave heating. Additive manufacturing (AM), often referred to colloquially as “3-D printing,” builds up objects by ‘adding’ layer upon layer, from computer models, rather than the current manufacturing practice of cutting away materials from a starting work piece. These are nascent techniques, but they could have a transformational impact, reducing materials use (dramatically, in some applications), reducing the weight of end products, and enabling the fabrication of complex structures that can’t be mass-produced using existing technologies. AM techniques can be applied across the manufacturing sector, but show particularly strong energy savings for sub-sectors that rely on the complex use of materials and components parts – and where the weight of the end product has enormous cost, competitiveness and life cycle energy implication -- such as automotive and aviation manufacturing. Key RDD&D challenges and opportunities for this technology include process controls that improve precision and increase throughput while maintaining the quality of the end product; scalability capabilities that enable larger volume production, both in size and number of parts produced; and more diverse material compatibility for new metal and polymer materials formulated for AM, providing application-specific properties such as flexibility, conductivity and low embodied energy. ASCCPMM, branded as ‘Smart Manufacturing,” involves technologies and practices that can capture, share, and process in real time the increasing amounts of information available at manufacturing facilities by using advanced sensors, data analytics, and control systems. The technologies and practices involved in Smart Manufacturing can interact at every level of the manufacturing sector, from equipment to plants to supply chains. They are valuable tools for energy management, and as such provide particular value for EIMs, where their application can model, predict, and optimize processes, with resulting energy savings ranging from 5% to 30%. Key RDD&D challenges and opportunities for Smart Manufacturing include developing lower power and more resilient wireless sensors; improving real-time measurement of equipment energy consumption and waste streams; open standards and interoperability for manufacturing systems and devices; and better cybersecurity in an era of proliferating cyberattacks. WBG technologies allow semiconductor applications at higher frequencies, temperatures and voltages, which in turn enable the production of smaller, lighter and higher efficiency power electronics. These technologies can realize very large energy savings for motor-driven systems across the manufacturing sector, and could also accelerate the motorization of specific equipment such as large compressors; in addition, WBG semiconductors can provide energy savings in a variety of applications in the building, transportation and power industry sectors. Key RDD&D challenges and opportunities for WBG semiconductors include reducing the cost of the substrate materials, most importantly silicon carbide and gallium nitride, compared to conventional silicon substrates currently in use; and improving their operating voltages and device reliability relative to silicon-based technologies. These summaries of a handful of AM technologies underline the importance of continued innovation. But the best innovation doesn’t happen in isolation at the lab bench. Rather, it’s generated by applied research and development, and by selective demonstration and deployment of these technologies, which in turn creates a technology learning feedback loop that advances the R&D. But the best innovation doesn’t happen in isolation at the lab bench. Rather, it’s generated by applied research and development, and by selective demonstration and deployment of these technologies. The most ambitious example of this approach for AM is Manufacturing USA, a public-private collaboration consisting of linked Manufacturing Innovation Institutes, each of which has a unique technology concentration while contributing to the advancement of the US manufacturing sector as a whole. Almost all industrial processes have been designed around the availability, low cost, and energy density of carbon-heavy fossil fuels. Decarbonizing the industrial sector will require strategically replacing fossil fuels for certain processes through increasing the use of clean fuel sources and electrification. The most important part of the value chain to focus such efforts on is industrial process heat, the largest source of fossil fuel use in the industrial sector. To transition to clean process heat, three considerations are worth emphasizing: (1) current conversion processes that transform raw materials into thermal energy in EIM subsectors require very high temperatures; (2) thermal heat cannot effectively be delivered over long distances; and (3) many process operations must be run continuously. Therefore, substitutes for fossil energy used for industrial heat processes must be dispatchable, able to achieve minimum temperature thresholds (depending on the operation), and located at or very close to the point of consumption. Substitutes for fossil energy used for industrial heat processes must be dispatchable, able to achieve minimum temperature thresholds (depending on the operation), and located at or very close to the point of consumption. There are select clean energy sources, albeit at different levels of commercialization, that could meet these criteria. Given their size and operational flexibility, small modular nuclear reactors (SMRs), show particularly strong promise as a supplier of industrial process heat. Light water SMR technologies currently being developed can produce thermal heat at temperatures up to 300 degrees centigrade (°C), which is hot enough to conduct some industrial activities like processing certain chemicals.53 Other heat sources would be needed to supplement these light water SMRs in order to achieve higher temperatures needed for additional industrial processes. However, other SMR technologies under development that use different types of coolants (e.g., high temperature gas) could provide outlet temperatures up to 850°C, which would make them applicable for a range of EIM sub-sectors, such as oil refining and chemical manufacturing.54 These would not be adequate solutions for sub-sectors that require direct heat at the highest temperatures, like the 1,700°C needed for iron and steel manufacturing or 1,500°C for cement. It has been estimated that one-third of projected US industrial energy demand in 2025 could be met by about 235 SMRs with a capacity rating of 150 MWt.55 Of course, this estimate is entirely theoretical as very few SMR projects in the US have a realistic chance of commencing operation by 2025.56 Nonetheless, the technical capacity exists for SMRs to decarbonize a substantial portion of industrial energy use by 2050. Solar thermal and (to a far lesser extent) geothermal energy sources could also play a role in meeting industrial energy demand. Concentrating Solar Power (CSP) plants may be able to produce heat at temperatures as high as 1000°C, which could make them applicable to roughly the same set of manufacturing subsectors as non-light water SMRs. Geothermal plants using current technology operate at much lower temperatures for thermal applications – up to 150°C -- which would allow them to provide thermal energy to a limited number of manufacturers with lower heat requirements, such as food processing. Both solar thermal and geothermal hold an important advantage over SMRs as potential clean heat sources: they are commercialized and deployed. But they are also at a disadvantage: the geographical mismatch between the best resources for the technologies and location of US manufacturing. For example, currently operating CSP plants are concentrated in the Southwest, where the best solar resources exist, whereas U.S manufacturing is concentrated in Midwestern, Eastern and Gulf Coast states. Another pathway for decarbonizing industrial energy use is through greater electrification of industrial process and power generation operations, linked with continuing efforts to shift the power sector to clean energy sources. Only 1% of conventional boilers and 10% of process heat applications in the industrial sector are electrified,57 and it’s technically feasible to scale up the deployment of electric boilers and electric heating technologies, including resistive, induction and infrared heating. The 2014 Intergovernmental Panel on Climate Change (IPCC) synthesis report estimates that climate mitigation costs will be 138% greater if CCUS technologies are not widely deployed.59 Therefore, the status of CCUS deployment is of paramount importance in evaluating the progress of climate mitigation strategies. The International Energy Agency (IEA) tracks the progress of a variety of clean energy technologies towards their Sustainable Development Scenario (SDS), which includes the Paris agreement climate goal of keeping global temperature increases well below 2°C.60 They schematically label technologies as (1) On track, e.g., Solar PV; (2) More efforts needed, e.g., a number of EIM sub-sectors; and (3) Not on track. Given the findings of the IPCC analysis and IEA’s SDS target tracking, we don’t think it’s an exaggeration to assert that the success of the international effort to keep global warming below dangerous levels hinges in no small part on our success over the next seven years in bridging the gulf between where we are in the deployment of CCUS technologies now and where we need to be in 2025. The US has the capacity to be the global leader in this effort, but domestic CCUS faces optical and economic barriers. In April of 2017, the world’s first BECCS project commenced full commercial deployment at an Archer Daniels Midland (ADM) ethanol plant in Illinois, which will inject 1 MMT of CO2 in a saline aquifer. Just three months earlier, the Petra Nova project in Texas started operations, the world’s largest CCUS deployment on an existing power plant; it will capture up to 1.4 MMT of CO2 annually, transporting it by pipeline to a nearby oil field, where it’s used for Enhanced Oil Recovery (EOR) and then sequestered. Despite the global significance of these projects coming online, the media reception to their deployment was vastly eclipsed by the announcement in 2017 by Southern Company and Mississippi Power that they were discontinuing the CCUS portion of their Kemper Power Plant, after years of development and billions of dollars of investment, and would instead operate it as a natural gas plant. The failure of Kemper, and other high-profile CCUS projects that preceded it, such as FutureGen in Illinois, are in part simply recent examples of the challenges of being first movers in the energy sector. It is always difficult to move new energy technologies to market, and the failure rate is high. But in addition to the typically high costs associated with first-of-a-kind projects, their demise was also a reflection of an economic perfect storm that emerged over roughly the same period they were developed. Arguably the most significant component of this perfect storm was the unprecedented drop in natural gas prices, which made it increasingly difficult for the retrofitting of existing coal fired power plants, let alone the construction of new plants, to be cost competitive with new natural gas plants. This cost crunch in turn made it all the more important for CCUS projects to find markets for their captured CO2, the most robust of which is EOR. But the precipitous drop in oil prices has limited the demand for EOR as well as the price that oil producers are willing to pay for the CO2 that enables it. The challenges of deploying CCUS in the US power sector show no signs of abating. However, current opportunities to deploy CCUS in the industrial sector are numerous and more economical. And unlike in the power sector, where various cheaper low and zero carbon alternatives to CCUS exist, in the industrial sector there are fewer and in many cases no emission reduction alternatives to CCUS. As detailed above, there are numerous ways in which we can and need to reduce industrial sector emissions. But there are thermodynamic, technological and economic limits to what proportion of GHG emissions from fossil fuel combustion can be mitigated by realizing greater energy and material efficiencies, and implementing electrification and fuel switching strategies. The challenges of deploying CCUS in the US power sector show no signs of abating. However, current opportunities to deploy CCUS in the industrial sector are numerous and more economical. The US GHG Inventory categorizes Industrial Processes and Product Use (IPPU) as emissions from industrial processes and the use of GHGs in products. Examples of IPPU emissions are those that result from the chemical transformation of raw materials and those that result from manufacturing processes and use by consumers. There's at least one estimate that a fast phasedown of HFCs could prevent 100 to 200 billion tons of CO2e by 2050 and up to 0.5C of global warming by 2100. Emissions from HFCs are distributed across the industrial, residential, commercial and transportation sectors. In fact, very few of these emissions come from the manufacturing process itself in the US, as manufacturers use reliable emission control equipment. Most result from the fugitive emissions of coolants and refrigerants in air conditioning and refrigeration systems in homes, businesses, and vehicles.72 We include this pathway in an industrial sector-focused report because it’s an example of how manufactured products, via supply chains, in effect move GHG emissions across the economy and because, given the dispersed nature of the end-products, the most impactful way to reduce them is at the source: by manufacturing alternative gases that emit low or no emissions. This substitution is already happening. US manufacturers are producing alternative gases for a variety of products in response to market demand from downstream manufacturers and end-use consumers. Indeed, a number of US companies are very well positioned to capture market share for these alternative gases as the market expands for them globally, with attendant economic gains for not only those companies but also American workers and the US economy more broadly. But while the shift from HFCs to alternative gases has started, it must occur more rapidly and in all countries in order to bend the curve on GHG emissions. This will be particularly important in emerging economies such as India, Brazil and China, where markets for refrigeration and air conditioning are expanding exponentially. In 2016 an agreement was reached in Kigali, Rwanda by nearly 200 countries to adopt a global phasedown in the production and consumption of HFCs. Fittingly, this agreement was reached at a Meeting of the Parties to the Montreal Protocol. Under the agreement, most developed countries will begin a phasedown in 2019 and most developing counties will begin in 2029. However, the path forward for US implementation is not immediately clear. In 2017 a federal court ruled against an EPA rule that banned the use of certain HFCs in specified applications, though that ruling is being appealed to the Supreme Court. Furthermore, the US Senate will almost certainly have to ratify the Kigali agreement as an amendment to the Montreal Protocol. Whether it’s workforce opportunity, U.S. competitiveness, or climate change, there are more than enough reasons to promote smarter, cleaner, more efficient energy use in the industrial sector. Many individual companies and manufacturing subsectors are already taking steps in the right direction. However, federal policy support will be needed to maximize the benefits that enhanced industrial energy performance can deliver for the country. In this report, we have identified the types of technologies and practices that will produce the most impactful improvements in this sector, and would suggest that policymakers focus their efforts on these particular pathways to success. Getting any meaningful policy objective over the finish line in Washington today is a challenge. But this issue has some powerful assets working in its favor—enormous potential for economic and environmental gains, a message that resonates with manufacturing communities across the country, and a potent combination of business, labor, climate, and other interests who are eager to help get the job done. This makes for a unique opportunity to advance a number of important national priorities while guaranteeing a stronger future for American industries and workers. Now is the time to seize it. The US has sporadically used voluntary goal setting, R&D efforts, best practices initiatives, and other discrete policy mechanisms to promote smarter energy use in specific industrial sectors, with some degree of success. China, on the other hand, is committing to ambitious long-term goals for energy efficiency and productivity across a wide swath of industries and is developing expertise in critical fields of low-carbon manufacturing. These policies are being implemented for the express purpose of combating air pollution and climate change, but China is also using them to position its manufacturers for competitive advantage in emerging markets for cleaner and more energy-efficient technologies, products, and materials. The Chinese government directs its national economy under the guidance of various action plans and policies that overlap and intersect. 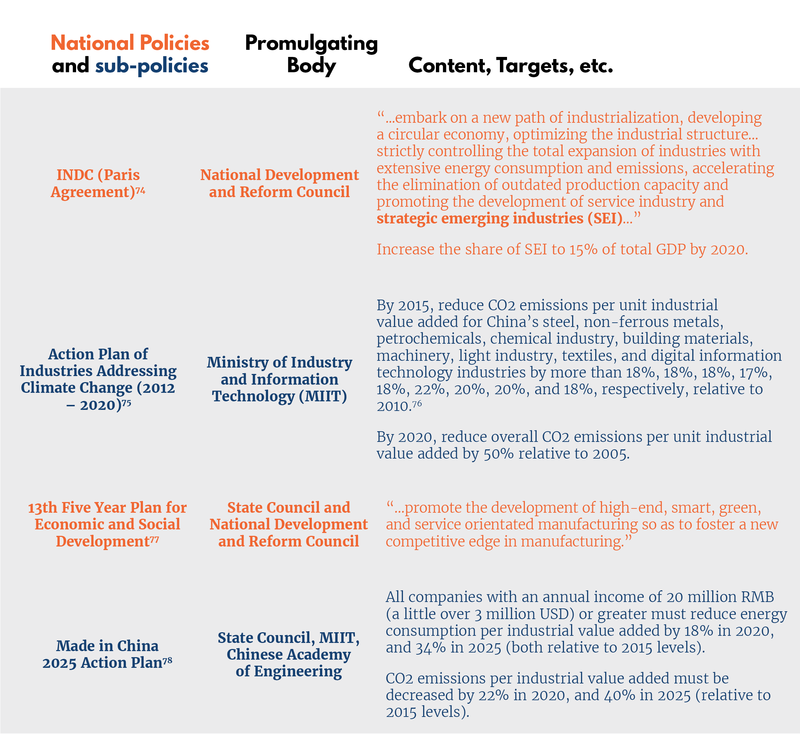 In Table A-1 we highlight the most important existing national policies that impact China’s industrial sector and industrial GHG emissions, along with sub-policies setting industry-specific requirements. China is implementing, or planning to implement, technology-specific and carbon pricing efforts that will contribute to the decarbonization of its industrial sector, helping to achieve the goals outlined in the policies above. Nuclear Energy: China is rapidly expanding its nuclear power program, investing in advanced high-temperature gas-cooled reactors which can provide flexible ratios of heat and electricity. Its HTR-PM is currently the worlds most advanced high temperature reactor project—a demonstration unit links two 250 MWt units with 750°C outlet temperature to a 210 MWe steam turbine.86 Reportedly, China plans to innovate on its HTR-PM reactor to allow for the direct replacement of coal power for hydrogen production, seawater desalination, and a wide range of other industrial processes.87 Though no nuclear industrial heating projects have been deployed yet, a feasibility study for nuclear powered district heating is currently being conducted by China General Nuclear. Emissions Trading System (ETS): In December 2017, China officially announced the rollout of a national ETS that links up the nine pilot cap-and-trade systems which the country has been operating at the city, provincial, and regional levels for the past several years.88 According to the announcement, the ETS will initially cover approximately 1,700 electric generating companies, which currently account for roughly one-third of China’s total emissions. By 2020, coverage will be extended to carbon-intensive industries such as steel, chemical manufacturing, building materials, textiles, and non-ferrous metals.89 China worked closely with the European Union (EU) in designing and deploying its ETS, and a three-year EU-China cooperation project on emissions trading which just began indicates China’s intent to link its ETS with other international carbon trading systems in the future. In addition to manufacturing, the industrial sector includes mining, agriculture and construction. “United States Manufacturing Facts,” National Association of Manufacturers, 2018. Accessed October 9, 2018. Available at: http://www.nam.org/Data-and-Reports/State-Manufacturing-Data/State-Manufacturing-Data/January-2018/Manufacturing-Facts---United-States/. “Top 20 Facts About Manufacturing,” National Association of Manufacturers, 2017. Accessed July 24, 2018. Available at: http://www.nam.org/Newsroom/Top-20-Facts-About-Manufacturing/; See also “How Important Is U.S. Manufacturing Today?,” Report, MAPI Foundation, September 13, 2016. Accessed July 24, 2018. Available at: https://mapifoundation.org/manufacturing-facts/2016/9/13/how-important-is-us-manufacturing-today. In addition to manufacturing, the industrial sector includes mining, agriculture and construction. See United States, Department of Energy, Energy Information Administration, “Use of Energy in the United States Explained, Energy Use in Industry,” December 15, 2017. Accessed July 18, 2018. Available at: https://www.eia. gov/energyexplained/index.php?page=us_energy_industry#tab2. The five highest-consuming EIM sub-sectors are chemicals (3.5 quads); petroleum refining (3.4 quads); paper (2.1 quads); iron and steel (1.2 quads); and food (1.1 quads). See United States, Department of Energy, Energy Information Administration, “Manufacturing Energy Consumption Survey, Fuel Consumption, Table 3.2,” October 2017. Accessed July 18, 2018. Available at: https://www.eia.gov/consumption/manufacturing/data/2014/pdf/table3_2.pdf; See also “Total Energy Consumption, Global Energy Statistical Yearbook,” Enerdata. Accessed on July 6, 2018. Available at: yearbook.enerdata.net/total-energy/world-consumption-statistics.html. “Manufacturing Energy and Carbon Footprint,” Energetics Incorporated, June 2015. Accessed July 18, 2018. Available at: https://www.energy.gov/sites/prod/files/2015/10/f27/manufacturing_energy_footprint-2010.pdf. Note that this uses data reported for 2010 Manufacturing Energy Consumption Survey (MECS). AMO has not yet calculated equivalent footprints using the 2014 MECS data released in 2017. The bandwidth studies estimate energy savings, but not GHG emission reductions. Similarly, the QTR data cited below references advanced manufacturing energy savings estimates, and GHG emissions reduction estimate in only a couple instances. This is due to the fact that the most common models for energy economy forecasting, such as the National Energy Modeling System (NEMS) used by DOE, are not able to incorporate the full impacts of disruptive technology changes. These bandwidths are estimated for processes and products studied and for all manufacturing within a sector based on extrapolated data. One important caveat: these estimates represent what is technically achievable; the cost of deploying these technologies is not factored in. The top ten states for potential industrial electricity savings were virtually the same, with small differences in ranking and the substitution of one state: North Dakota instead of Nebraska. See United States, Department of Energy, Office of Energy Efficiency and Renewable Energy, “U.S. Energy Efficiency Potential Maps,” 2016. Accessed July 18, 2018. 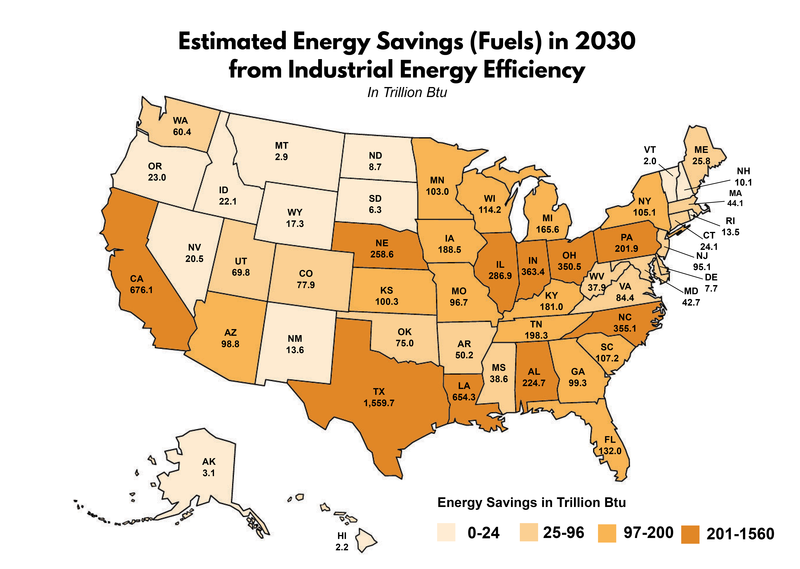 Available at: https://www.energy.gov/eere/slsc/us-energy-efficiency-potential-maps. state: North Dakota instead of Nebraska. In 2017, the US consumed a total of 97.7 quads of primary energy. The six-state total potential energy savings is 3.95 quads. “U.S. Energy and Employment Report,” National Association of State Energy Officials, May 2018. Accessed July 18, 2018. Available at: https://www.usenergyjobs.org. While the USEER can’t disaggregate these jobs by the economic sector in which they are performed, it can be assumed that a significant portion of these construction workers are installing energy efficient technologies in industrial facilities. “Change Is in the Air: How States Can Harness Energy Efficiency to Strengthen the Economy and Reduce Pollution,” American Council for an Energy Efficient Economy, April 2014. Accessed July 18, 2018. Available at: https://aceee.org/research-report/e1401. “Responsible Leadership for a Sustainable Future,” Group of Eight (G8) Summit, Item 65, 2009. Accessed July 18, 2018. Available at: https://grist.files.wordpress.com/2009/07/g8_declaration_08_07_09_final,0.pdf. United States, Department of Energy, Energy Information Administration, “Fuel economy standards have affected vehicle efficiency,” August 3, 2012. Accessed July 18, 2018. Available at: https://www.eia.gov/todayinenergy/detail.php?id=7390. Note that CO2 comprises the largest share of GHG emissions (81.5% of total emissions), but there are other GHGs which are released during industrial processes. The inventory aggregates these other gases using the measure CO2 equivalent (CO2e). Our analysis excludes the Inventory’s reported emissions from U.S. territories which are small fraction of the total. If U.S. territory data is included, the overall percentage of U.S GHG emissions from the transportation, electric power, and industrial sectors are adjusted to 28.5%, 28.4%, and 21.6% respectively. See United States, Environmental Protection Agency, “Inventory of U.S. Greenhouse Gas Emissions and Sinks: 1990-2016,” April 12, 2018. Accessed on July 6, 2018. Available at: https://www.epa.gov/ghgemissions/inventory-us-greenhouse-gas-emissions-and-sinks-1990-2016. “Generation and Use of Thermal Energy in the US Industrial Sector and Opportunities to Reduce its Carbon Emissions,” The Joint Institute for Strategic Energy Analysis (JISEA), December 2016. Accessed July 2018. Available at: https://www.nrel.gov/docs/fy17osti/66763.pdf. Indirect industrial emissions totaled 489.3 MMT CO2e in 2016, or 26% of total emissions from industry. 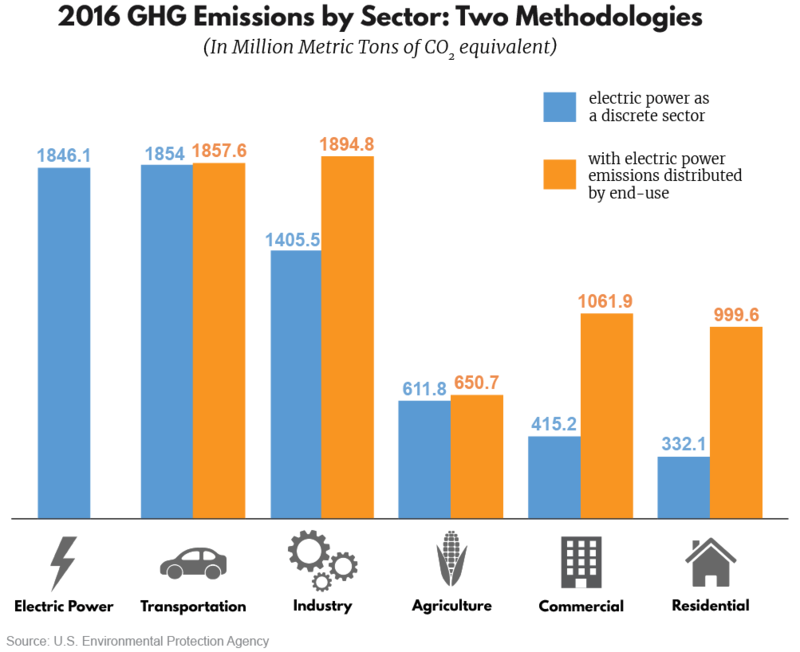 These indirect emissions are tied to electricity obtained from the power grid (e.g., for motors, ovens, space heating and cooling, lighting). See United States, Environmental Protection Agency, “Inventory of U.S. Greenhouse Gas Emissions and Sinks: 1990-2016,” p. 2-28, 2-29. April 12, 2018. Accessed on July 6, 2018. Available at: https://www.epa.gov/ghgemissions/inventory-us-greenhouse-gas-emissions-and-sinks-1990-2016. E.g., process heating for furnaces, kilns and dryers which releases CO2 as a primary pollutant. E.g., cement and ammonia production, which releases nitrous oxide and other GHGs in addition to CO2. HFCs were used to replace ozone depleting CFCs, but HFCs themselves are potent GHGs. United States, Environmental Protection Agency, “Inventory of U.S. Greenhouse Gas Emissions and Sinks: 1990-2016,” Table 2-6, April 12, 2018. Accessed on July 6, 2018. Available at: https://www.epa.gov/ghgemissions/inventory-us-greenhouse-gas-emissions-and-sinks-1990-2016. Though overall industrial activity has grown, it is helpful to note that global industrial sector GHG emissions have increased over the same time period as US reductions, from 10.4 gigatons (Gt) of CO2 Eq. in 1990 to 15.4 Gt CO2 Eq. in 2010. See “Climate Change 2014: Mitigation of Climate Change,” Intergovernmental Panel on Climate Change, 2014, Chapter 10, p. 743. Accessed July 18, 2018. Available at: https://www.ipcc.ch/pdf/assessment-report/ar5/wg3/ipcc_wg3_ar5_chapter10.pdf. As a specific example, North America’s share of global crude steel production has fallen from 15.9% in 2000 to 6.8% in 2016, while China’s has soared over that same time period from 15.1% to 49.6%. It can be assumed that much of the 25 million tons of crude steel production lost to North American manufacturers during this time was shifted to China. A 2015 DOE study found that the carbon intensity of China’s iron and steel industry was 24 percent greater than the US (2,148 kilogram CO2/tonne crude steel in China versus 1,736 kgCO2/ton in the US). See “World Steel in Figures 2017,” World Steel Association, May 29, 2017. Accessed July 18, 2018. Available at: https://www.worldsteel.org/media-centre/press-releases/2017/world-steel-in-figures-2017.html; See also United States, Department of Energy, Office of Science, Lawrence Berkeley National Laboratory, “Comparison of Energy-Related Carbon Dioxide Emissions Intensity of the International Iron and Steel Industry: Case Studies from China, Germany, Mexico, and the United States,” December 2015. Accessed July 18, 2018. Available at: https://eta.lbl.gov/sites/default/files/publications/co2_comparison_of_steel_industry-final-1.11.2016.pdf. United States, Department of Energy, Energy Information Administration, “Annual Energy Outlook 2018,” p. 16 February 6, 2018. Accessed July 18, 2018. Available at: https://www.eia.gov/outlooks/aeo/pdf/AEO2018.pdf. “Intended Nationally Determined Contributions (INDCs) as Communicated by Parties,” United Nations Framework Convention on Climate Change (UNFCCC). Accessed July 18, 2018. Available at: http://www4.unfccc.int/submissions/indc/Submission%20Pages/submissions.aspx. “Pricing Carbon,” The World Bank. Accessed July 18, 2018. Available at: http://www.worldbank.org/en/programs/pricing-carbon#CarbonPricing. Neelam Singh and Lindsey Longendyke, “A Global Look at Mandatory Greenhouse Gas Reporting Programs,” World Resources Institute, May 27, 2015. Accessed July 18, 2018. Available at: http://www.wri.org/blog/2015/05/global-look-mandatory-greenhouse-gas-reporting-programs; See also Kauffmann, C., C. Tébar Less and D. Teichmann, “Corporate Greenhouse Gas Emission Reporting: A Stocktaking of Government Schemes”, OECD Working Papers on International Investment, June 12, 2012. Accessed July 18, 2018. Available at: http://dx.doi.org/10.1787/5k97g3x674lq-en. “Putting a price on carbon: Integrating climate risk into business planning,” Carbon Disclosure Project (CDP), October 2017. Accessed July 18, 2018. Available at: https://b8f65cb373b1b7b15feb-c70d8ead6ced550b4d987d7c03fcdd1d.ssl.cf3.rackcdn.com/cms/reports/documents/000/002/738/original/Putting-a-price-on-carbon-CDP-Report-2017.pdf?1507739326. BNEF does not include nuclear or CCUS in its definition of ‘clean energy’ and therefore doesn’t track investments in these energy technologies. See Veronika Henze and Catrin Thomas, “Runaway 53GW Solar Boom in China Pushed Global Clean Energy Investment Ahead in 2017,” BloombergNEF, January 16, 2018. Accessed July 18, 2018. Available at: https://about.bnef.com/blog/runaway-53gw-solar-boom-in-china-pushed-global-clean-energy-investment-ahead-in-2017/. David Hart and Colin Cunliff, “Federal Energy RD&D: Building on Momentum in Fiscal Year 2019,” Information Technology and Innovation Foundation, April 2018. Accessed July 18, 2018. Available at: http://www2.itif.org/2018-federal-energy-rdd.pdf. “A Sustainable Benchmark,” Arcon-Sunmark, 2018. Accessed July 18, 2018. Available at: http://arcon-sunmark.cn/en/references/codelco-minera-gaby-chile. “Projects Database: Abu Dhabi CCS,” Global CCS Institute, 2017. Accessed July 18, 2018. Available at: https://www.globalccsinstitute.com/projects/abu-dhabi-ccs-project-phase-1-being-emirates-steel-industries-esi-ccs-project; See also “MENA’s first Carbon Capture Utilisation & Storage (CCUS) project now on stream,” Press Release, MASDAR, November 5, 2016. Accessed August 8, 2018. Available at: https://masdar.ae/en/media/detail/menas-first-carbon-capture-utilisation-storage-ccus-project-now-on-stream. “States, Cities, and Businesses in the United States Are Stepping Up on Climate Action,” Report, America’s Pledge, November 2017. Accessed July 24, 2018. Available at: https://www.americaspledgeonclimate.com/reports/. State of California, Assembly, “AB-262 Public contracts: bid specifications: Buy Clean California Act,” January 31, 2017. Accessed July 18, 2018. Available at: https://leginfo.legislature.ca.gov/faces/billVersionsCompareClient.xhtml?bill_id=201720180AB262. Jeremy Deaton, “California seeks to lead on emissions with program that will boost U.S. steel,” ThinkProgress, June 21, 2017. Accessed July 18, 2018. Available at: https://thinkprogress.org/buy-clean-california-act-3b354e8d5e71/. “The Growing Demand for Renewable Energy among Major U.S. and Global Manufacturers,” David Gardiner and Associates, September 19, 2017. Accessed July 18, 2018. Available at: https://www.dgardiner.com/wp-content/uploads/2017/09/Renewable-Energy-and-Climate-Commitments-in-the-Manufacturing-Sector_FINAL9.19.2017FINAL.pdf; See also United States, Department of Energy, “Better Plants Progress Update Fall 2017,” 2017. Accessed July 18, 2018. Available at: https://betterbuildingssolutioncenter.energy.gov/sites/default/files/attachments/2017_Better_Plants_Progress_Update.pdf. There is a thermodynamic minimum of energy required for industrial processes even under the most ideal conditions. This is not to suggest that such feedstock and material switching isn’t worthy of vigorous R&D. It is. There are some potentially disruptive technology pathways to explore, such as using zero emission energy sources to power electrolysis for hydrogen production, which in turn could be used in various industrial sub-sectors as chemical precursors, process agents, and fuels. However, examining these kinds of pathways is beyond the scope of this report. The most common CHP system is a “topping cycle,” in which fuel is first combusted to generate electricity, and then a portion of the heat left over from the electricity generation process is converted into useful thermal energy. There are also “bottoming cycle” systems, more commonly known as Waste Heat to Power, which use the reverse process: fuel is first combusted to provide thermal input to industrial process equipment, and the heat “wasted” from the process is then captured and used for power production. The current deployment and technical potential estimates referenced here include both types of systems. The use of natural gas as the primary fuel for CHP raises an important question for further research: To what extent are the emission reduction benefits of CHP systems offset by the lock-in emission effects of fossil fuel-sourced heat and power cogeneration over the long term, as compared to fuel switching and electrification (see below). 1.8 Quads of fuel energy is the equivalent of 1.75 trillion cubic feet of natural gas. In 2018, the Bakken region’s average daily natural gas production exceeded 2 billion cubic feet per day, meaning its yearly total was 0.73 trillion cubic feet. See United States, Department of Energy, Energy Information Administration, “Drilling Productivity Report for Key Tight Oil and Shale Gas Regions,” July 2018. Accessed July 18, 2018. Available at: https://www.eia.gov/petroleum/drilling/pdf/dpr-full.pdf. United States, Department of Energy, Office of Energy Efficiency and Renewable Energy, “Department of Energy Releases Updated Combined Heat and Power Installation Database,” July 19, 2017. Accessed July 18, 2018. Available at: https://www.energy.gov/eere/amo/articles/department-energy-releases-updated-combined-heat-and-power-installation-database. United States, Department of Energy, Office of Energy Efficiency and Renewable Energy, “Combined Heat and Power (CHP) Technical Potential in the United States,” p. 1, March 2016. Accessed July 18, 2018. Available at: https://www.energy.gov/sites/prod/files/2016/04/f30/CHP%20Technical%20Potential%20Study%203-31-2016%20Final.pdf. Ibid, Calculated from Tables III-3 and III-6. Examples of energy management practices include systematic energy management, which consist of long-term, ongoing approaches (such as the ISO 50001 International Energy Management Standard) that drive continual improvements at the facility level and across manufacturing supply chains. Cumulative avoided CO2 emissions were 34.7 MMT through 2015 as reported in the 2016 Update. In the 2017 Update, the first under the Trump administration, DOE removed all metrics and references related to CO2 emissions. See United States, Department of Energy, “Better Plants Progress Update Fall 2017,” 2017. Accessed July 18, 2018. Available at: https://betterbuildingssolutioncenter.energy.gov/sites/default/files/attachments/2017_Better_Plants_Progress_Update.pdf. United States, Department of Energy, Office of Energy Efficiency and Renewable Energy, “Advanced Manufacturing Office (AMO) Multi-Year Program Plan for Fiscal Years 2017 Through 2021,” December 2016. Accessed July 18, 2018. Available at: https://www.energy.gov/eere/amo/downloads/advanced-manufacturing-office-amo-multi-year-program-plan-fiscal-years-2017. United States, Department of Energy, Office of Energy Efficiency and Renewable Energy, “Static Sankey Diagram of Process Energy in U.S. Manufacturing Sector.” Accessed July 18, 2018. Available at: https://www.energy.gov/eere/amo/static-sankey-diagram-process-energy-us-manufacturing-sector. United States, Department of Energy, “Energy Innovation Portfolio Plan, FY2018-FY2022,” January 2017. Accessed July 18, 2018. Available at: https://www.energy.gov/downloads/energy-innovation-portfolio-plan-fy-2018-fy-2022. R. Boardman, M. McKellar, D. Ingersoll, Z. Houghton, R. Bromm, and C. Desportes, “EXTENDING NUCLEAR ENERGY TO NON-ELECTRICAL APPLICATIONS,” Final Report from 19th Pacific Basin Nuclear Summit. Accessed August 13, 2018. Available at: https://www.osti.gov/servlets/purl/1169226. “Generation and Use of Thermal Energy in the US Industrial Sector and Opportunities to Reduce its Carbon Emissions,” The Joint Institute for Strategic Energy Analysis (JISEA), Table 10, December 2016. Accessed July 2018. Available at: https://www.nrel.gov/docs/fy17osti/66763.pdf. The Utah Associated Municipal Power Systems worked with DOE to attain a site permit at the Idaho National Laboratory to potentially operate an SMR. Tennessee Valley Authority has also submitted an early site permit application to potentially build SMR units at a site in Oak Ridge, Tennessee. NuScale currently is aiming to begin operations at its first plant in 2026. See Jim Polson, “First Small-Scale Nuclear Reactor May Be Just Eight Years Away,” Bloomberg, April 10, 2018. Accessed July 18, 2018. Available at: https://www.bloomberg.com/news/articles/2018-04-10/first-small-scale-nuclear-reactor-may-be-just-eight-years-away. United States, Department of Energy, National Renewable Energy Laboratory, “Electrification & Decarbonization: Exploring U.S. Energy Use and Greenhouse Gas Emissions in Scenarios with Widespread Electrification and Power Sector Decarbonization,” July 2017. Accessed July 18, 2018. Available at: https://www.nrel.gov/docs/fy17osti/68214.pdf. United States, Department of Energy, National Renewable Energy Laboratory, “Electrification Futures Study: End-Use Electric Technology Cost and Performance Projections through 2050,” 2017. Accessed July 18, 2018. Available at: https://www.nrel.gov/docs/fy18osti/70485.pdf. “Climate Change 2014 Synthesis Report Summary for Policymakers,” Intergovernmental Panel on Climate Change, p. 25, 2014. Accessed July 18, 2018. Available at: https://www.ipcc.ch/pdf/assessment-report/ar5/syr/AR5_SYR_FINAL_SPM.pdf. “Tracking Clean Energy Progress,” International Energy Agency. Accessed July 18, 2018. Available at: http://www.iea.org/tcep. “Tracking Clean Energy Progress: CCUS in industry & transformation,” International Energy Agency, May 23, 2018. Accessed July 18, 2018. Available at: http://www.iea.org/tcep/industry/ccs. “The Global Status of CCS. Special Report: Introduction to Industrial Carbon Capture and Storage,” Global CCS Institute, p. 7-8, June 2016. Accessed July 18, 2018. Available at: http://hub.globalccsinstitute.com/sites/default/files/publications/199858/Introduction%20to%20Industrial%20CCS.pdf. “[The breakeven cost] represents the CO2 selling price that is required for the base plant to recover all of the costs associated with implementing CO2 separation (where applicable), purification, and compression.” See United States, Department of Energy, National Energy Technology Laboratory, “Cost of Capturing CO2 from Industrial Sources,” p.1, January 10, 2014. Accessed July 18, 2018. Available at: https://www.netl.doe.gov/research/energy-analysis/search-publications/vuedetails?id=1836. United States, Department of Energy, Office of Fossil Energy and National Energy Technology Laboratory, “Industrial CCS Opportunities,” Unpublished, 2016. United States, Department of Energy, “QER Report: Energy Transmission, Storage, and Distribution Infrastructure,” April 2015. Accessed July 18, 2018. Available at: https://www.energy.gov/sites/prod/files/2015/07/f24/QER%20Full%20Report_TS%26D%20April%202015_0.pdf. “21st Century Energy Infrastructure: Policy Recommendations for Development of American CO2 Pipeline Networks,” Great Plains Institute, State CO2-EOR Deployment Working Group, February 22, 2017. Accessed July 18, 2018. Available at: http://www.betterenergy.org/blog/21st-century-energy-infrastructure-policy-recommendations-development-american-co2-pipeline-networks/. Simon Bennett and Tristan Stanley, “Commentary: US budget bill may help carbon capture get back on track,” International Energy Agency, March 12, 2018. Accessed July 18, 2018. Available at: https://www.iea.org/newsroom/news/2018/march/commentary-us-budget-bill-may-help-carbon-capture-get-back-on-track.html. “Carbon Capture Innovation Challenge,” Mission Innovation. Accessed July 18, 2018. Available at: http://mission-innovation.net/our-work/innovation-challenges/carbon-capture-challenge. United States, Environmental Protection Agency, “Inventory of U.S. Greenhouse Gas Emissions and Sinks: 1990-2016,” Table ES-4, April 12, 2018. Accessed on July 6, 2018. Available at: https://www.epa.gov/ghgemissions/inventory-us-greenhouse-gas-emissions-and-sinks-1990-2016. “Primer on HFCs,” Institute for Governance & Sustainable Development, p. 5, May 19, 2017. Accessed July 18, 2018. Available at: http://www.igsd.org/wp-content/uploads/2017/05/HFC-Primer-19May2017.pdf. Aerosols, foams and solvents are the other primary sources. United States, Department of Energy, Office of Science, Lawrence Berkeley National Laboratory, “Benefits of Leapfrogging to Superefficiency and Low Global Warming Potential Refrigerants in Room Air Conditioning,” October 2015. Accessed July 18, 2018. Available at: https://eta.lbl.gov/publications/benefits-leapfrogging-superefficiency. People’s Republic of China, Ministry of Finance and the Ministry of Industry and Information Technology, “Issued in the Action Plan for Climate Change in the Industrial Sector (2012-2020),” January 9, 2013. Accessed July 18, 2018. Available at: http://www.miit.gov.cn/n1146290/n1146417/n1146532/c3303711/content.html. Whether or not China reached these 2015 emissions reduction targets is still unclear, as the relevant data have not yet been made public. People’s Republic of China, “The 13th Five-Year Plan for Economic and Social Development of The Peoples Republic of China 2016 – 2020,” 2016. Accessed July 18, 2018. Available at: https://policy.asiapacificenergy.org/sites/default/files/The%2013th%20Five-Year%20Plan%20For%20economic%20and%20social%20development%20of%20the%20People%27s%20Republic%20of%20China.pdf. People’s Republic of China, Economic Council, “%u4E2D%u56FD%u5236%u9020 2025 / Made in China 20205,” Report, May 8, 2015. Accessed July 24, 2018. Available at: http://fgw.chuzhou.gov.cn/download/58d37c0fe4b07e877d1ee5b3. “China’s Strategic Emerging Industries: Policy, Implementation, Challenges, & Recommendations,” The U.S.-China Business Council, March 2013. Accessed July 18, 2018. Available at: https://www.uschina.org/sites/default/files/sei-report.pdf. “China strives to make strategic emerging industries account for 15% of GDP by 2020,” China.com, July 23, 2012. Accessed July 18, 2018. Available at: http://www.china.com.cn/policy/txt/2012-07/23/content_25987991.htm. “China’s strategic emerging industries see robust growth,” Xinhua Net, July 5, 2017. Accessed July 18, 2018. Available at: http://www.xinhuanet.com/english/2017-07/05/c_136420143.htm. “Made in China 2025: Global Ambitions Built on Local Protections,” U.S. Chamber of Commerce, March 16, 2017. Accessed July 18, 2018. Available at: https://www.uschamber.com/report/made-china-2025-global-ambitions-built-local-protections-0. “Worldwide Status of CCUS Technologies and Their Development and Challenges in China,” Geofluids, August 28, 2017. Accessed July 18, 2018. Available at: https://www.hindawi.com/journals/geofluids/2017/6126505/abs/. Emily Feng, “China looks to capture millions of tonnes of CO2,” Financial Times, May 22, 2017. Accessed July 18, 2018. Available at: https://www.ft.com/content/d6ee4558-36d7-11e7-bce4-9023f8c0fd2e. “Nuclear Process Heat for Industry,” World Nuclear Association, October 2017. Accessed July 18, 2018. Available at: http://www.world-nuclear.org/information-library/non-power-nuclear-applications/industry/nuclear-process-heat-for-industry.aspx. “China plans further high temperature reactor innovation,” World Nuclear News, September 19, 2017. Accessed July 18, 2018. Available at: http://www.world-nuclear-news.org/NN-China-plans-further-high-temperature-reactor-innovation-1909171.html. Gu Yang, “National carbon emissions trading system officially launched,” Economic Daily, December 20, 2017. Accessed July 18, 2018. Available at: http://www.gov.cn/xinwen/2017-12/20/content_5248687.htm. Li Jing, “China to launch nationwide carbon market next week: officials,” Climate Home News, December 14, 2017. Accessed July 18, 2018. Available at: http://www.climatechangenews.com/2017/12/14/china-launch-nationwide-carbon-market-next-week-officials/.